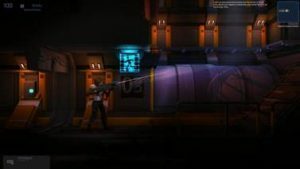 Dark Matter (Retail $14.99), from Iceberg Interactive, is a side scrolling sci-fi adventure. It feels like a throwback to arcade style classics, but with a smooth, modern sensibility. 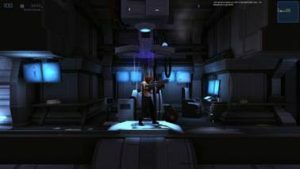 Play as the heroine, known only as Ensign, as she wakes from cryogenic sleep aboard the spaceship Endeavour. Aided only by the voice of the on-board A.I., she must explore her derelict craft, whose crew has all been killed by the strange alien creatures that still roam the ship. 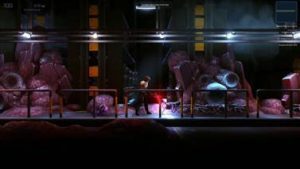 With shadows filling each corridor, the eerie sounds of a deserted spacecraft, and tension building with each newly explored room, be prepared to creep your way into a suspenseful sci-fi thriller, as it creeps it’s way around your nerves. The Endeavour is filled with danger and alien life forms, wanting nothing more than to snuff out the last human on-board. One of these alien creatures is a glowing spore-like growth that covers the floor, seemingly harmless until you step on it, causing its pulsating pods to explode. Its toxic nature is activated by light, so you’ll have to gently walk over it in full, terrifying darkness if you want to survive. This is nerve wracking, but not too difficult. You’ll really need to look out for the more active creatures. These armored, spider-like parasites will scuttle across the floor, or out of air ducts, and attack you head on. They are vicious, hissing, creepy crawlers who can deal a lot of damage. They are also intelligent enemies, and will learn your fighting style, so stay alert and vary your attacks. You aren’t defenseless though. You can build an arsenal of 4 unique weapons, each with 4 different types of powerful ammo, as well as optional upgrades. Freeze, electrocute, dissolve, and set fire to the nasty creatures at will. Like any side-scrolling game, the environments are 2D, but you aren’t limited to moving in one scrolling direction like some games. You can explore freely between rooms and floors of your spacecraft. Search for scrap as you go, to craft health packs and tools, and find blueprints for the computer systems and door locks. You’ll also want to keep your eyes open for stocks of ammo, so you’ll always be prepared for enemy attacks. The A.I. voice of the Endeavor is helpful and sympathetic to your plight, since as the last human on the ship, you are his only hope of continued existence as well. He will guide you when he can, especially when you first wake up and need a tutorial. This game is a great blend between the classic side scrolling games and the newer, heart pounding survival horror genre. 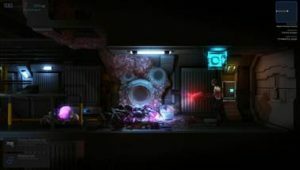 It is a true test of a player’s tactical abilities, as you are given the options of using resources to hide from the aliens, or to engage them in battle with weapons drawn and trigger fingers poised for sudden attack. Armed with a weapon and a flashlight, you must fearlessly navigate the halls and ladders, never knowing what could be lurking around the next dark corner. 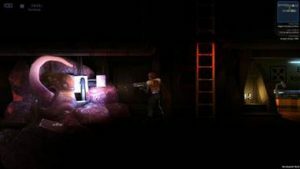 With 14 vast levels to explore in this dark, gritty environment, you’ll be engaged for hours. The clean lines and hand-painted look of the graphics, along with the tension-building soundtrack, lend a unique and captivating feel to this game. 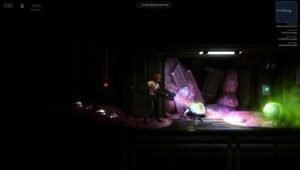 Dark Matter is a sci-fi adventure not to be missed! Available for download for PC and Mac, on Steam.